Honda Motor Co. is turning to an insider who has spent his entire career at the company to navigate its exit from a global auto safety crisis, after seven people died in its cars. Takahiro Hachigo this week becomes the eighth president of one of Japan’s most renowned companies. By replacing Takanobu Ito, whose tenure was plagued by recalls and rupturing Takata Corp. air bags, he upholds a 41-year custom of Honda presidents hand-picking their successors from within. The steps Hachigo, 56, takes to tackle the troubles caused by its supplier will help determine whether he’s the right man for the job. His supporters say he’s a listener willing to seek consensus, traits that his more autocratic predecessor lacked. Still, those attributes won’t sway detractors who want more radical change and a break from the insularity that has long characterized Japan Inc.
“Japanese electronics-makers failed partly due to internally promoted top managers; I hope Honda won’t fall into the same rut,” said Kentaro Hayashi, a Tachibana Securities Co. analyst in Tokyo, who has recommended selling Honda shares for more than a year. Honda has so far relied on incremental steps, such as delaying new models and doing post-production checks to improve quality, rather than more radical changes such as severing ties with Takata. Defective Takata air bags that can deploy with too much force and spray metal at motorists have led Honda to recall about 20 million vehicles, by far the most among 11 affected carmakers. Most of those cars are still on the road, as Takata can’t make replacements fast enough. Honda confirmed Friday that a seventh death has been linked to a Takata air bag in one of its cars. The carmaker fell 1.4 percent to ¥4043.5 as of 10:07 a.m. in Tokyo trading on Monday, while the Topix index dropped 0.5 percent. Little known among outsiders before Honda announced his promotion in February, Hachigo will need to decide whether to maintain the relationship with Takata. The carmaker owns a 1.2 percent stake in the supplier and is its biggest customer, according to data compiled by Bloomberg. The more than 50-year relationship has already begun to show signs of fraying. In a U.S. congressional hearing related to the air bags in December, Honda was the first carmaker to say it was turning to Takata’s rivals for some replacement parts. It also agreed to expand recalls nationwide, hours after Takata refused regulators’ demands to do so. While Takata agreed to nationwide recalls last month, it also began to deflect blame, saying air bags may be rupturing in part because of unspecified flaws in automakers’ vehicle designs and lapses in how they tested and validated inflators. For now, Honda and its peers are counting on Takata to continue ramping up inflator production to speed up repairs that will take years to complete. Adding to Honda’s quality woes under Ito, 61, were five recalls for its top-selling Fit compact and three for its Vezel SUV. Lapses with those models led the company to cut pay for executives, including Ito, for three months. The quality problems were widely seen as a main reason for Ito’s departure. Days before announcing Hachigo’s promotion, Ito abandoned a target to sell 6 million vehicles annually by 2017. 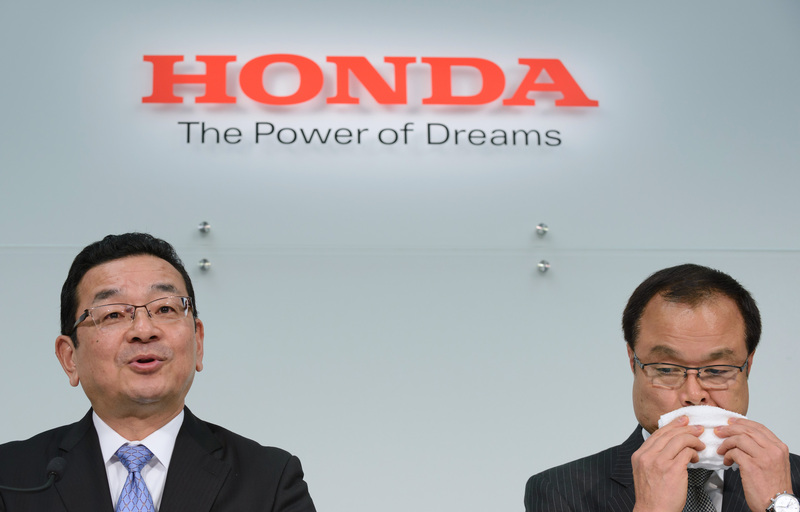 Parissa Haghirian, a professor of management at Sophia University in Tokyo, said it’s “clear” Honda needs a new strategy, but that it’s doubtful whether Hachigo will have the power to shake things up. Koichi Fukuo, who was in charge of product quality at Honda before becoming president of its research and development arm, said insufficient communication contributed to the company’s quality problems. The easy-going Hachigo will help improve internal communication, said Fumihiko Ike, Honda’s chairman. As an engineer, Hachigo was involved in high-profile projects including the first U.S.-built Odyssey minivan and the CR-V SUV. He then managed the company’s Suzuka plant in Japan and rose through the ranks via executive roles in Europe and China before becoming managing officer last year. His hobbies include collecting miniature cars and building model trains, according to the company. 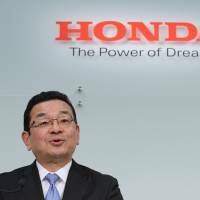 His appointment surprised even among those loyal to Honda’s tradition of promoting presidents from within, because of a unique gap in his resume. He’ll be the first CEO who hasn’t headed Honda R&D Co., the carmaker’s largely independent research arm, since Soichiro Honda founded the company in 1948. Familiarity with the R&D unit is crucial at a time when automakers are racing to roll out new electric and fuel-cell vehicles, said Endo, the Advanced Research Japan analyst.